A while back I commented that there seemed to be a real advantage to megadungeon play where it came to front-loading the prep. Well, we brought little Melody back from the hospital today, and looking forward to our first night home, I had been hoping to get in a session after we put my eldest to bed. No way. To make the session concept I have in mind fun, I need to plan a few things out. Sequence out the events, think about the challenges and ‘puzzles,’ figure out some branched scenarios on what the PCs might do. I don’t think I’d have needed maps today, but I didn’t want to rely on my improv skills to early in the game. I wonder if what i need to do is make an “effective” megadungeon in the same way that one would map Zork. I don’t necessarily think that the right way to do this would be a ConsPyramid, from Night’s Black Agents, but I could be wrong about that. Actually, I can see how this would be handy. 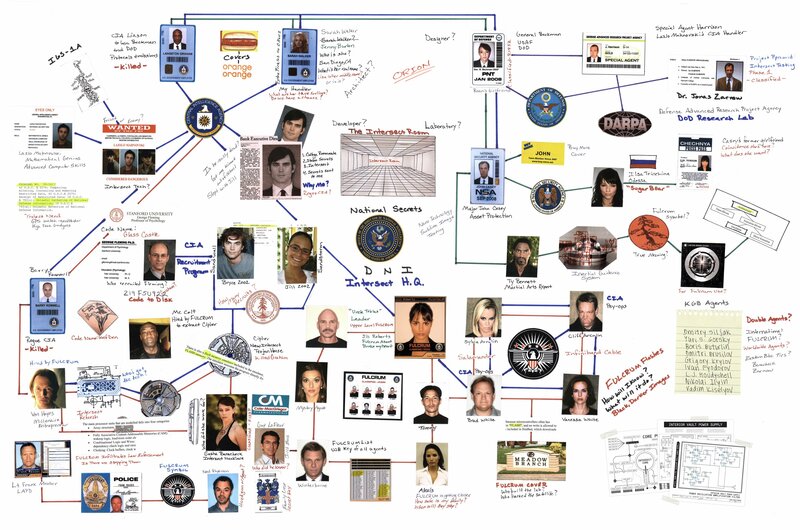 Some sort of relationship map, like Charles Bartowski made in Chuck, might be just the ticket here. A few overlapping triangles, a nested Conspiramid/Goals and Objectives map, would allow the players to start dictating the pace of events (like in a megadungeon) instead of ‘no GM worm-on-a-hook, no game’ (which is where we are for episodic play now). If I can get the game to start (or ideally, end) with “what we need to do next is . . . ” that will allow a whole bunch of agency in the game, as well as feed me plot seeds. I can always break out the locomotive when I need to, but having it be somewhat up to the players, such as “we need to find a frombotzer. Let’s look for a world with the following characteristics and go delve!” will take some of the pressure off. Still, I do have a fun idea for the next mission. I just need time to flesh it out. I see you slowly backing away from a wall covered in photos and index cards connected with bits of string, muttering "This… means something…"
Take this with a grain of salt, since I'm in a general gaming drought, but what I found generally worked well for me was getting to know the setting well enough to improvise in it. Of course, this may mean creating a megadungeon of sorts, but that level of detail really isn't necessary. Relational maps (for how areas or people interrelate), future calendars (for future events), and such are a huge help though. That and just have enough enemies statted up or modular enough to make on the fly to stave off boredom (Oh, gee, another zombie. Let me fetch my chainsaw…). Frankly, it sounds like you're headed down this path, already, so I guess keep steaming on! And good luck getting things to wrap up when you want them to. If you figure out how, please share! You might find https://bubbl.us/ useful, although I really find myself wishing it had some kind of sort/organization function to rearrange bubbles into specific patterns.